It's time to go crazy for citrus! Click here to play! Spin these reels to see if you can gather as many citrus fruits as possible and you'll find yourself coming into quite a bit of money. 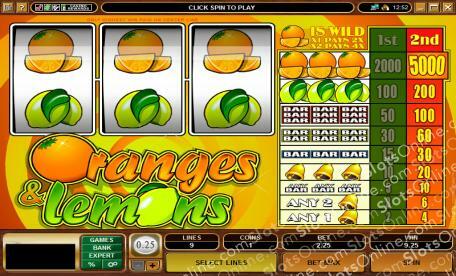 Oranges will pay out the most in this classic 3 reel game. Spin three of them across the single pay line and you'll bring in a massive 5000 coins! In addition, they act as a wild symbol and will substitute for all other symbols to help you bring in even more wins! Next in line are the lemons. Keep your eyes peeled for these sour fruits as three of them across the pay line will pay out up to 200 coins. Spin three triple, double, or single BARS to get up to 100, 60, or 30 coins respectively. And ring three golden bells for a shot at 20 coins. Keep in mind that you'll need to wager the maximum of two coins in order to play the highest pay table in this 3 reel game. Go crazy for citrus in this classic game and you could see yourself bringing in plenty of big money wins! The oranges act as a wild. They will replace all other symbols to help you bring in more wins. If one of them appears in a winning line, you will double your prize. If two appear in a winning line, you will quadruple your prize.